The iPad Air 2 is thinner and lighter and has new features including the Touch ID fingerprint scanner, new processor, improved cameras and 11ac Wi-Fi. However, most of the changes won't be overly noticeable on a day-to-day basis so unless you want more than 32 GB of storage, we wouldn't blame you for sticking with your iPad Air or going for the older model to save some cash. With the iPad Air having one round to the Galaxy Tab S's four, the Samsung tablet is the clear winner of this head to head review. Featuring a better display, better camera and noticeably better battery life, the Galaxy Tab S is one of the finest tablets currently available. However, with four of the rounds having resulted in draws and the iPad Air remaining the more secure option, it was a closely fought battle and the Galaxy Tab S's victory isn't too surprising considering how far through its product lifecycle the Apple tablet is. The iPad Air is a fantastic piece of kit. The design, build quality, performance and battery life are all superb. This will suit those wanting a device to browse the web, check emails, view documents and consume multimedia content. But the iPad Air is not going to suit everyone, particularly when it comes down to cost. It’s too early to say which tablet is the best, as we still need to test performance, battery life and camera quality among other things. It’s clear that the Tab S 10.5 is a strong rival to the iPad Air, but for those who own other Apple products the iPad Air may remain the obvious choice. Now, with the iPad Mini with Retina Display, you can have the same resolution and performance, so the choice you have to make really comes down to size. If you travel all of the time and want a tablet that you'll barely notice you're carrying, the iPad Mini with Retina Display is the clear choice. If you carry your tablet less often and want the benefits of a larger screen, the iPad Air is the clear winner and it's not actually that much bigger. 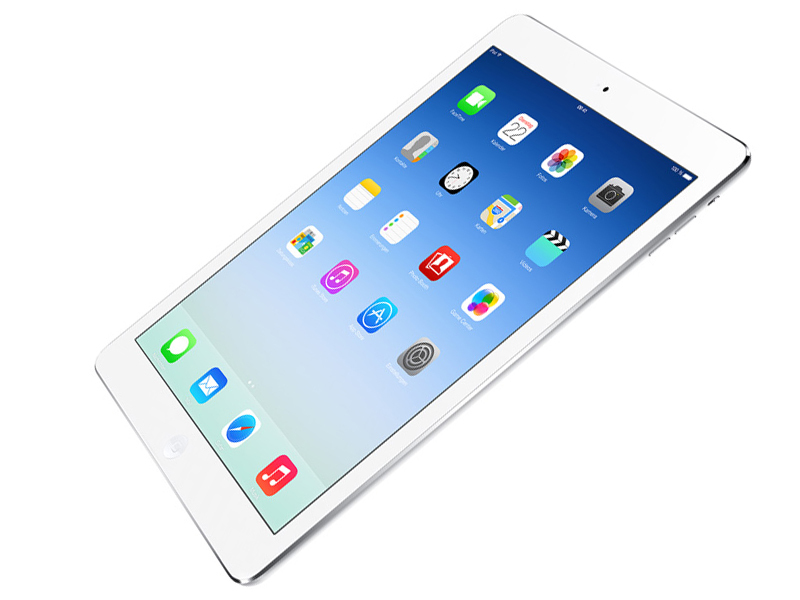 In terms of size, price and performance the iPad Air is our favourite tablet. First things first: these are two outstanding devices. The iPad Air is the best 10in tablet around for media consumption, communication, games, web browsing and social media. If you want to make your commute more bearable and to surf the web while you watch TV, head for the iPad. But if you can afford it and it makes sense to you to carry only one device that is PC, tablet and laptop, the Surface Pro 3 is a truly stunning achievement. Microsoft Surface Pro 3 vs iPad Air comparison: Can the Surface Pro 3 rival Apple's iPad Air? Overall, while the iPad Air and Surface Pro 3 are both tablets, they're aimed at very different audiences and are therefore difficult to directly compare. The Surface Pro 3 is designed to fit the needs of professionals who would prefer not to carry around both a laptop and a tablet. Perhaps they're creatives, or businesspeople, or even journalists. The iPad Air can cater to those audiences too, but not always entirely, and that's what Microsoft has been trying to point out (it says 96 percent of iPad owners also own a laptop). But the iPad Air is still very powerful, can achieve most day-to-day tasks, and also offers up thousands of tablet-optimised apps for your entertainment, communication, education and productivity. The iPad Air is the finest tablet currently available to humanity. But the same was once true of the iPad 4; is this enough of an improvement to warrant an upgrade? The Air has two main advantages over the iPad 4: it's slimmer and lighter, and it's faster. The former is an appealing upgrade, since the iPad 4 can tire the arm when used one-handed, particularly for reading. But the latter won't make much difference for most users right now, since the iPad 4 is already more than powerful enough to deal with current apps. If you're on the iPad 3 or earlier, on the other hand, the Air is a no-brainer: a gossamer-light, gorgeous-looking, Lightning-compatible tablet with a super-fast processor and a decent price tag. Five months on we remain delighted with the iPad Air, its sleek looks and its super-slick performance. iPad Air vs iPad 4 comparison review: Which is the best full-size iPad? If you're on the iPad 3 or earlier, the iPad Air is a highly appealing buy, and a bit of a bargain, we'd say. But paying the same price all over again a year (or less) after shelling out for the iPad 4 may be less clear-cut, unless you're flush with cash. Do you find your arm aching after using your iPad 4? If you find this annoying, the iPad Air is the answer to your prayers. But for us - and, we'd guess, for most users - arm ache is only an occasional annoyance, and not really worth spending upwards of 400 quid all over again. There's no doubting that with the iPad Air Apple has made its best tablet so far. It's absolutely beautiful to look at, has a stunningly fast processor, excellent battery life and an amazing touchscreen. While the iPad 4 is far from out-of-date, the power and size on offer here could be compelling enough of a reason to upgrade. For most people, we think the hardest decision is going to be one of size, and whether they should buy the iPad Air or the smaller, but identically specced, iPad Mini with Retina Display. It's a tough call and the incredibly lightness and slim case of the iPad Air may just swing it for the larger tablet: it's something we'd happily carry everywhere. It's our new Ultimate award-winning tablet and the best you can get. The iPad Air is the finest tablet currently available to humanity. But the same was once true of the iPad 4; is this enough of an improvement to warrant an upgrade? The Air has two main advantages over the 4: it's slimmer and lighter, and it's faster. The former is an appealing upgrade, since the iPad 4 can tire the arm when used one-handed, particularly for reading. But the latter won't make much difference for most users right now, since the iPad 4 is already more than powerful enough to deal with current apps. If you're on the iPad 3 or earlier, on the other hand, the Air is a no-brainer: a gossamer-light, gorgeous-looking, Lightning-compatible tablet with a super-fast processor and a decent price tag. Three months on we remain delighted with the iPad Air, its sleek looks and its super-slick performance. Even though the iPad Air scored an impressive five stars when we reviewed it on release last year, since then the market has moved on and having won four of our nine rounds to the iPad Air’s three, we’ve got to give the best enterprise tablet award out of these two devices to the Samsung Galaxy Note 12.2in. However, with two of the rounds resulting in draws the battle has been a close one and both tablets certainly have merit in the workplace. The Galaxy Note Pro 12.2 offers users a sizeable display, an array of productivity-focused applications and services, a robust battery life and a useful S Pen stylus. But to counter this, the iPad Air boasts a more travel-friendly design, more robust security and is significantly cheaper. 80% iPad Air review - latest iPad is great, but is the iPad still the best tablet? The Apple iPad Air starts at Rs 35,900 for the 16GB, Wi-Fi model and we feel this is a bit too much for what’s on offer. The drastic weight loss and new internals aside, we don’t see why someone would buy the Air instead of the 32GB iPad mini with Retina. Not only are you getting double the capacity but it’s spec-for-spec identical to its larger sibling. We’ve also seen that 16GB is simply not enough for iPad apps and your media files, so there’s another problem. If Apple had fitted a better camera (8MP iSight from the iPhone 5) and Touch ID (from the 5s), then there would be a better distinction between the two tablets and perhaps, the high starting price of the Air could be justified. Overall, if really must have the extra 1.9-inches of the Air, then go for it but we strongly suggest you get the equally well equipped 32GB iPad mini with Retina for the same price. This is truly the new iPad we've wanted for a long time, at least as far as the design and form factor is concerned. With the iPad Mini, it was clear that Apple's focus would be on improving the portability and use comfort. The only drawback is that the thinner aluminum on the back does not feel as solid as the previous generations. But, without doubt, the best tablet in the market is now even better. For yet another year Apple has secured its place as king of the 10in tablet space. However, given the fact that the Nexus 10 is over a year old at this point, this isn't really all that surprising. We're amazed that the Nexus 10 managed to stack up as well as it did against Apple's new iPad Air given its age. We can't wait to see what Google has up its sleeve for the next Nexus 10, and, given the ongoing usefulness of its original, it will undoubtedly be impressive. Summarizing the iPad Air is tricky business. One one hand, Apple has done some great things here, most notably with the physical design. The iPad Air isn't just lighter than its predecessor, it's almost half-a-pound lighter, which is a significant reduction in weight that's both noticeable and appreciated. In many respects a triumph, the iPad Air also introduces compromises to hit the low-weight/thin-case targets. Sound quality through the mono speaker has deteriorated, and although a matter of taste we found the iPad mini-style case loses the premium feel of preceding generations of iPad. Make no mistake - Apple has finally nailed the tablet with a great combination of specs, power and a decent OS. It's a joy to hold the iPad Air. From the clever construction to the fast processor to the improved user interface, Apple has found an answer to every criticism we had of the device and then some. You've seen the score, and for those keeping tabs you'll realise this is TechRadar's first five-star tablet. It's a device with almost no flaws - it's not just Apple's best tablet, it's the only tablet you should be considering this Christmas if you're keen on a larger screen. The display on the iPad Air is no longer the highest resolution panel found on a tablet but it continues to look as good as ever. I have zero complaints with the IPS display as colors and text were sharp and vivid while brightness remained a strong point. The 4:3 aspect ratio will still cause some to gripe compared to 16:9 offerings that are more suited to video and the outdoor performance isn’t anything to write home about. Either way, I suspect this screen will continue to be used in future iPads as there’s simply nothing wrong with it. If you’re looking to pick up a full-sized tablet this holiday season, the iPad should be near the top of your list if Android isn’t a priority for you. In the event you already own an iPad, an upgrade to the Air should be a justifiable investment should you have the third generation tablet or older. If you’re rocking the fourth generation, I would probably stick with it until next year’s model shows up. Apple has always said that the iPad isn’t intended to replace a laptop, and if you need to run the full version of Microsoft Office then there are many Windows laptops, as well as tablets such as the Microsoft Surface, that will be more suitable. However, the arrival of Apple’s iWork and Microsoft Office Mobile proves that the iPad Air can certainly handle productivity software when it needs to. It perhaps will come as little surprise that the iPad Air has won in a head-to-head review over its predecessor, the iPad 4, but is it worth the upgrade? We think so. While there's not that much in the way of new specs beyond the upgrade to Apple's 64-bit A7 chip and the firm's iOS 7 operating system, the iPad Air is so much more comfortable to use due to its slim profile and low weight. Apple always likes to talk about the “magical” experience of using the iPad, and holding the iPad Air in my hands does remind me of what it was like when the very first iPad was launched. I can understand why the fanbois who already own the iPad 4 weren’t tempted to queue overnight to buy the iPad Air, but people like me who have an older iPad may well find the urge to upgrade hard to resist this Christmas. When Apple unveiled the iPad Air, many dismissed it as simply another rehash with a faster processor. The iPad Air is the best iOS tablet to date – with a sleek design, excellent performance and battery life. But be warned: the 16GB of storage on the entry level model will get used up quickly by large 64-bit apps, so it's worth considering the 32GB option if you're an app junkie. Given that the iPad 4, with the backing of the App Store and its huge selection of tablet-specific apps, was our favourite tablet before this one came along, there's only one conclusion: the iPad Air replaces the iPad 4 at the top of our A-List tablet category. It's quite simply the best tablet around. The iPad was already the best large tablet out there. If it had any deficiencies, it was really in terms of weight and size, and that’s where the iPad Air shines. It’s still got a battery that will last for 10 hours, and now it’s twice as fast as it was before, opening the door for even more apps that can boost personal productivity or just entertain you that much faster. It’s right there in the name: The iPad Air is still an iPad, but it’s lighter and thinner and twice as fast to boot. If you want a tablet you can comfortably hold with one hand, look elsewhere. Otherwise, look no further than the iPad Air. Calling this the iPad Air could be seen as a gimmick: a marketing ploy designed to invoke the excitement of an all-new product, when in fact so much is carried over from previous iPads. But the truth is that the iPad Air is every bit the dramatic update its name suggests. The iPad Air is the best overall 10-inch tablet you can buy by quite a margin. The huge weight reduction makes the larger of the two iPads a far more attractive option again, while retaining all the iPads traditional strengths such as its unrivalled collection of tablet optimised apps. A revolution it isn't, but we find it very hard to see how Apple can top this version now. The iPad Air is, undoubtedly, the best iPad Apple has produced yet, and by far the most comfortable full-sized tablet we've used. We're not sure the inclusion of a 64-bit chip is worth users getting too excited about yet. While it offered a slight bump in performance, and likely aided the improvement in battery life, the iTunes App Store is still desolate when it comes to 64-bit optimised apps. The only real improvement – besides the slightly better performance and battery life – is its design, and the new-look thin and light tablet makes it worth the upgrade. Apple's new iPad Air is impressive small considering the features and performance that it manages to pack into it. The design mimics that introduced by the Mini but it still feels incredibly well built and solid. Performance has received a significant boost and the battery life is still one of the best available on the market. The iPad Air isn't going to please everyone, but it'll please most people. Just as there's more than one great computer, there can be more than one great tablet: The slender iPad Air lifting its touch-centric apps up on a pedestal, the simple Kindle Fire helping everyone along, and the businesslike Windows tablets shuttling their Office documents and Photoshop files. As with the iPhone 5S, Apple is trying to make both the hardware and the OS step into the background here, so you can better enjoy the apps. The best iPad, Apple implies, is one that disappears. Surprise: the iPad Air is the best iPad we've reviewed. In addition, though, it's also the most comfortable 10-inch tablet we've ever tested. Not every manufacturer can produce a thin and light device without also making it feel cheap or flimsy, but Apple nailed it. Factor in a sizable boost in performance and battery life, and the Air is even more compelling. Our reviewer's mind was put at rest by a brief hands-on with the new tablet: "The iPad Air feels solid enough - despite its low weight, it was sufficiently stiff to set our minds at rest concerning 'snapping accidents'. 9.7": La diagonal de la pantalla es usada para pequeños tablets. Grandes tamaños de pantalla permiten resoluciones más altas. Por tanto, los detalles como letras son más grandes. Por otro lado, el consumo de energía es más bajo con diagonales de pantalla más pequeñas y los aparatos son más pequeños, más livianos y más económicos. 0.464 kg: Este peso es típico para pequeños tablets. 91.17%: No existen muchos modelos que sean evaluados mejor. La mayoría de las evaluaciones obtienen resultados que son un poco peores.